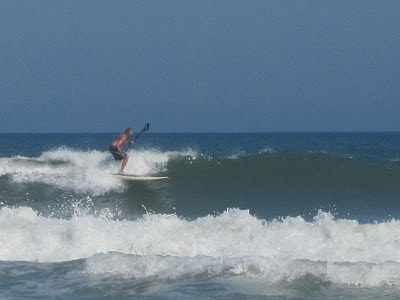 The swell from Hurricane Danielle began hitting the Maryland/Virginia beaches sometime in the early morning hours of Sunday, August 29. When we pulled into the parking lot at our favorite summer-time beach break, we were greeted by long clean lines that were being groomed by a 10 knot offshore wind. Approximately head high, with sets a foot or two larger. Session one lasted 4 hours in clean conditions. Lots of speed runs starting with one or two turns and then quickly up to the nose trying to outrun the rapidly pitching/sucking thick walls. Usually successfully. Not actually ON the nose - my Ron House 11’0” single fin is much happier when I’m 12 – 18 inches back. 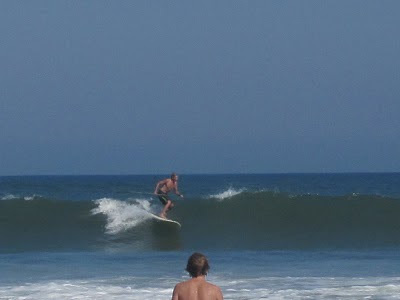 At midday, the wind went on-shore and inexplicably, the swell got substantially smaller for a few hours. The good news though was that the change in conditions caused my now fully-hooked-on-surfing 16 year old daughter to get out of the water for awhile, and I prevailed on her to get the camera out and spend 15 minutes trying to capture some of the SUP action for John’s Paddlesurf.net blog. Not bad for her first attempt, but of course she completely missed the clean overhead pitching right that I paddled into when I first got back out. So here are a few photos. I realize that for you California guys, these will look like a marginal day. Oh well . . . next time I’ll try to find a non-surfer to snap some photos before the conditions deteriorate, and maybe prove that it does sometimes get good on the right coast. Glenn and I first met when he contacted me at the tail end of a business trip out here to California. He told me he'd be staying in L.A. but was determined to get in the water. I gave him a couple of tips for spots in the Los Angeles area and then invited him down to San Diego for a surf- if he could fit it in. I was stoked when he told me he was going to squeeze in a day of paddling with me in my hometown. On a bright blue morning, Glenn rolled up in front p.net corporate headquarters hopped into the bomber and off we went looking for waves. We ended up scoring. The go-to spot was head high, north beach Coronado- as glassy as can be with zippy left hand wedges racing up the beach into the inshore holes. It was classic California and it was on! Glenn got a chance to try out a couple of the boards he'd seen on the site and I got to make a new friend. You can surf day after day and not remember one wave the second you pull off of it- but good friends and good times last forever. I've since met Glenn's two wonderful daughters and even taught them the basics of stand up paddling (while Glenn thoughtfully poached a little mini-session on the ocean side of the Strand). He's a good friend and if I ever get the chance I'm going to visit him on his beach, snag a couple on the right coast and eat a soft shell crab or something "east coasty" like that. Thanks for the update Glenn and keep charging! Nice! That is so much better conditions than what we have just 800 miles to the south. When is the onshore wind going to atleast slow down? Supposed to be pretty large tommorrow here in Fl. NE Bahamas bouy had some 17.4ft @ 16 seconds last night. My favorite right dredger should be working if the darn wind will cooperate. They will be getting ready for Earl now. Looks like it will pass near the outerbank and cruise the coast. Stay safe and have fun when you can.. I withdraw the Holy Crap and give a "loud" GOOD GOD 42ft @17 seconds off the Bahama bouys now. UHHH WOW! Interesting to see and hear the thunderous crack of actual waves breaking here in the morning. Yeah Marina! Get on down here and grab a piece of our town... water's still cold so you'll feel at home!